Welcome to the West Side Mutual Self Inspection. This form may take up to 1 hour to complete. This property survey is solely for company underwriting purposes. Underwriting surveys and resulting request are for the benefit of this company and not for any other person. This survey is not intended to be, nor should it be, considered a substitute for inspections of the various heating, electrical and mechanical systems on your property. Those systems should be inspected and maintained by qualified professionals. This survey was not made to determine or warrant that the property or operation are safe or healthful or in compliance with any law, rule or regulation. Message and data rates may apply. Please answer a few questions so we can locate the correct policy for this self inspection. Please provide us some details on the inspection property itself. How many outbuildings are on the property? Please describe your pet and their breed? Please describe your pets and their breeds? Smoke detectors must be replaced every 6 to 10 years depending on the manufacturers requirements. Smoke detectors that are expired may not function correctly even with fresh batteries and should be discarded. If you have any questions about smoke detectors, please contact your local fire department. Smoke detectors should be checked every 6 months. Make sure to use the self test button on the smoke detector once every 6 months to ensure the device is still functional. We now have a few questions about the heating and cooling systems present in your home. What is the primary heat source for the home? When was the current central A/C system installed in the home? 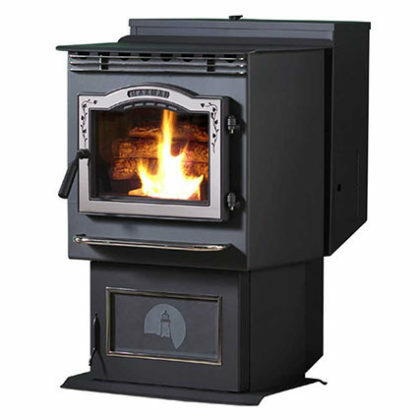 This includes corn, wood, or pellet burning stoves. For example: Is it in an attached or detached structure or in your home? Or in the family room or basement? You will now be asked to provide several internal and external photos to your home. If you cannot safely take a photo of an item, skip uploading that photo and move on to the next item. West Side Mutual can send a trained inspector to take photos if you would like. 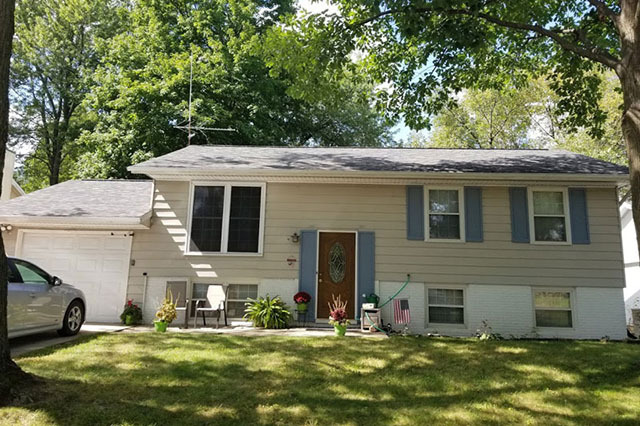 Please provide us with a photo of the front of your home. The front of your home is the side which faces the street which contains your mailbox. 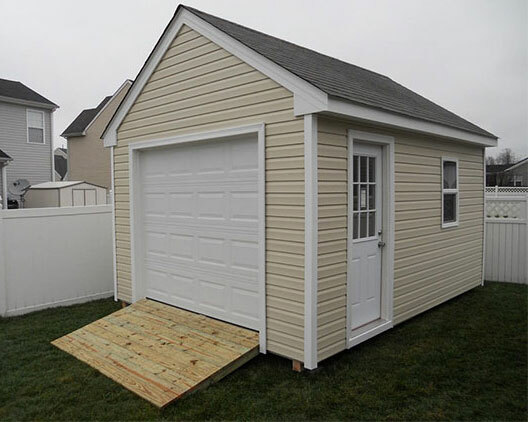 You may need to step back from your home to fit the entire house in the photo. Make sure that the photo includes any attached structures. 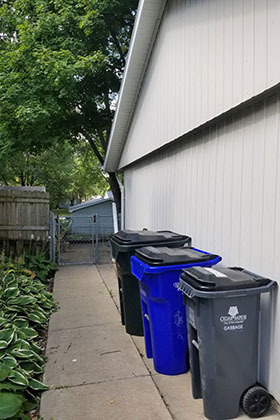 Please provide us with a photo of the left side of your home. The left side of your home is the side that is to your left if you are standing in front of your home, facing it. 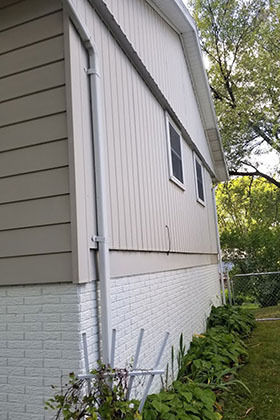 Please provide us with a photo of the right side of your home. The right side of your home is the side that is to your right if you are standing in front of your home, facing it. 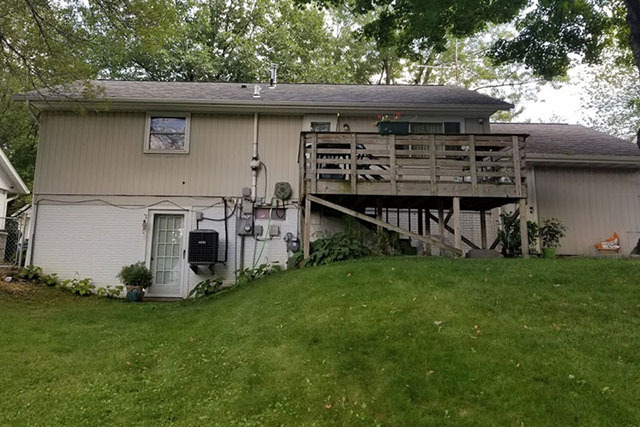 Please provide us with a photo of the rear of your home. The rear of your home is the side opposite to the front. 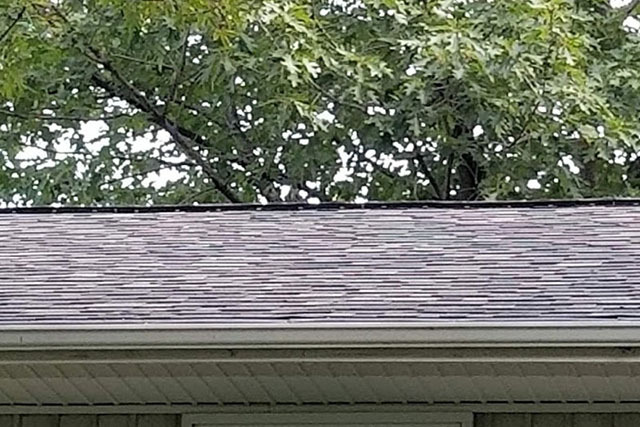 Please provide us with a photo of the roof of your home. 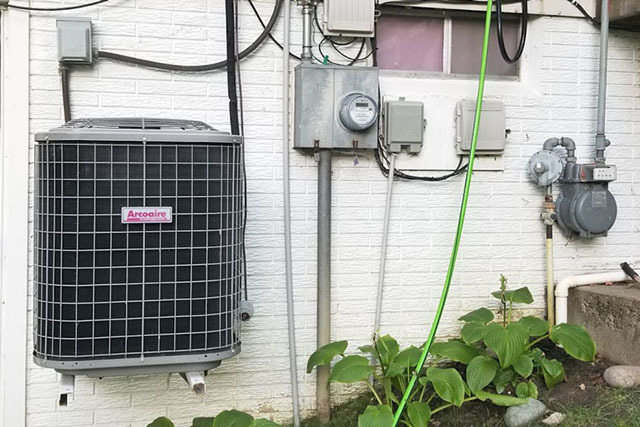 Please provide us with a photo of the central A/C unit present on your home. Please provide us with a photo of the location where the electrical meter is located. Please provide us with a photo of the outbuilding. Please take photos of the remaining outbuildings and attach them. Please provide us with a photo of the solid fuel burner. 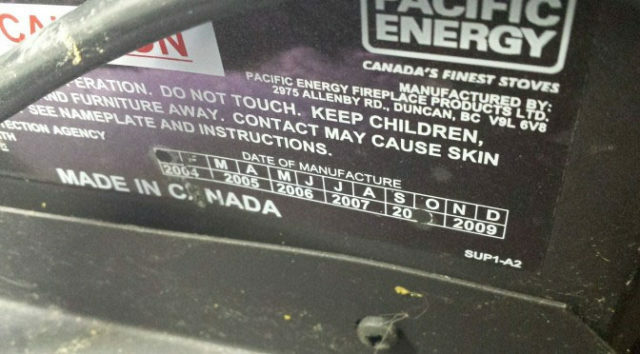 Please provide us with a photo of the warning label on the woodburner. 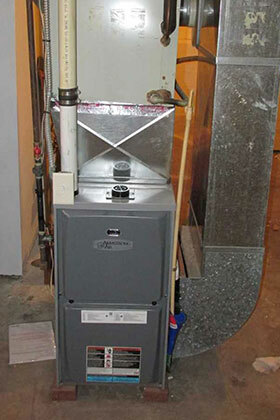 Please provide us with a photo of the main furnace that heats your home. Please provide us with a photo of your water heater. 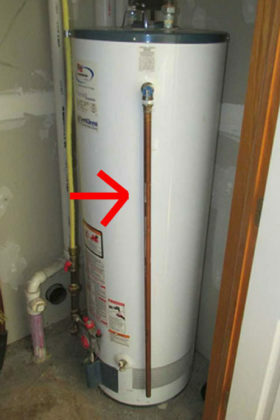 Please make sure the release valve pipe (noted with red arrow in example photo) is in view on the photo. 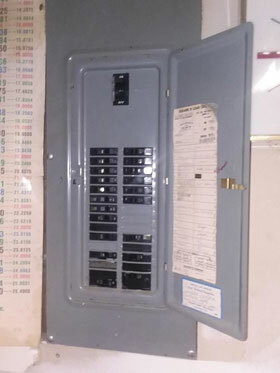 Please provide us with a photo of your circuit breaker/fuse panel. Please make sure the panel door is open for the photo. You have completed the self inspection form.